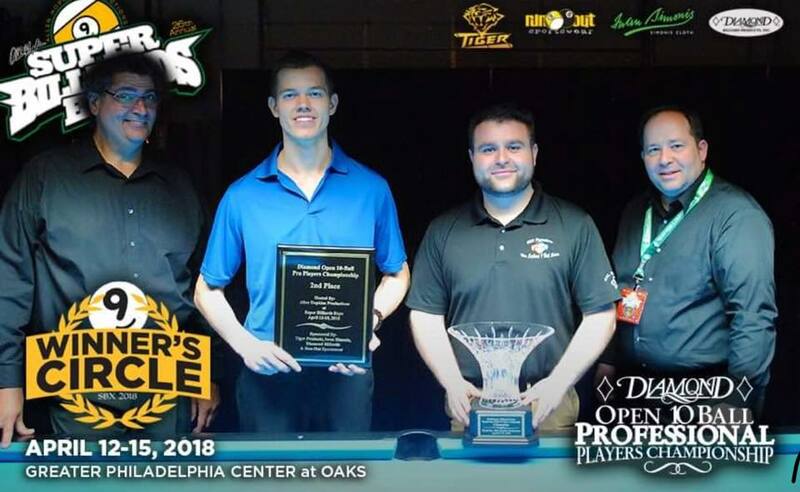 Last week April 12-15 the Greater Philadelphia Expo Center at Oaks hosted the 26th Annual Super Billiards Expo. This was my fourth time attending this event in the last 8 years and outside of the one at Valley Forge this was the best experience I had. For those that attended the older location we are all aware of the magic atmosphere this place had especially in the "action pit" that is near impossible to replicate. With every major pool company in attendance as exhibitors, a men and women's pro event a 1000 player amateur event along with events for seniors and juniors it is impossible for me to say I have ever had a bad time at one of these events. There was just something about that Valley Forge experience that I will never forget, its like comparing all your relationships to your first love. This year the Pro Arena was the best set up I have seen in a few events. Two years ago when I was there last the Pro Arena was where the Action Pit was this year. The switch was crucial as this made for a much bigger venue for the Pro Men's and Women's events which played side by side. The crowds were bigger as it was only $10 a session and $20 a session for VIP with two session a day. There was many favourites in this event such as, Shane Van Boening, Jayson Shaw, Alex Pagulayan, Dennis Orcullo to name a few. The format for the Pro 10 Ball was a little different then any other tournament I have ever seen at this level, which made it interesting to say the least. It was 10 ball played with 9 ball rules which meant no call shot. Also once the tournament got down to the final 16 the winners and the losers continued on in the same brackets however it was now single elimination. Most tournaments that switch to single elimination mid tournament usually pit the winners vs the losers. This is a curious format for a few reasons, beginning with it tempts some players to purposefully lose early on to obtain a better draw to the final "theoretically". Also if you are an event selling tickets why would you risk losing some of your big stars earlier than you have to? That being said for those players who are not on paper a favourite to win it gives them a chance to go a little deeper than might otherwise have and perhaps give them a chance to catch a gear. This is what happened to Danny Olson, a strong player from North Dakota but not really on the radar as a potential threat to win before this event started. For a player I have not been around much I have to say I was very impressed with his workman's like demeanor all week. He does not say much, no antics just breaks like a monster and shoots straight. Olson won the losers bracket with some impressive lop sided wins against Martin Daigle, and John Morra. In the Semi-Final Olson met up with Oscar Dominguez and edged out a close win 13-10, this was a high level match filled with a lot of safety and strategical battles. On the winners side bracket Mike "Fireball" Dechaine was cruising through this tough field. Dechaine was on fire beating Hohmann 13-6 then Strickland 13-1 and Jayson Shaw 13-9 before meeting Olson in the final. Olson had another impressive performance but Fireball was just too much as he went on to win 13-10 to capture this prestigious title. Congratulations to all the winners in this event I look forward to going back next year. Thank you to Allen Hopkins Jr and Sr for the press pass for the event it made my life a lot easier. On a side note this win was even more impressive for Dechaine as I believe he no longer travels and works a "real" job, just goes to show you the amount of talent there is out there. Thanks Markus. Haven't seen any matches so I appreciate your commentary.. event is over.. why not show the rest of the world what we missed? ?